My younger son is obsessed with all technological things. He loves to quietly test buttons and see what they do and try again to confirm.He started crawling when he was 11 months and was not much bothered with moving around except at the site of any laptop especially my macbook. He will try to move in anyway to get to it semi crawl, move his hands hoping that it will magically bring it to him and magically it did arrive to him some how. He would even attempt to fly if that was possible. 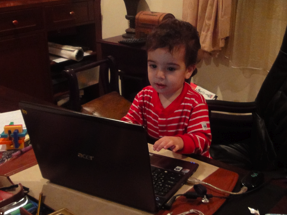 As he gets older now he sneaks to laptops or when he sees me typing he would come close, hug me, kiss me and then politely point in the air as if he was pressing a virtual button and nods his head at the same time. His cute way of asking permission to use it. And again I give in to his cuteness. Lately he extended his obsession to the ipad. He know how o use it and has few favorite apps that he keeps on using. He gets frustrated when his little tabs are not sensed by the screen and would say “this this” and points at the application that he wants me to press. I remember 20 years ago children played with different things. Now every day objects for them to fiddle with have changed and I wonder how does that affects their development. Would it make them smarter? Would it develope certain characteristics such as patience as things load onto the screen or an increased imagination with the plethora of images they are introduced to? How does that affect their sense of reality?